Sometimes life throws a curveball that ends up changing everything. In Alex Garb’s case, life shot a curve-puck at her. Alex was poised to become the lead goalie on Team Canada’s roller hockey team, a position that she had trained hard for over the years and proved herself worthy of attaining. Three days before the official tryouts at the end of April 2018, Alex was on new roller skates and in the net playing goalie on a men’s team. She’s that good. While attempting to stop a puck racing toward her, Alex turned her knee in a defensive move but her foot stayed firmly planted. Maybe it was the new skates. The twist movement made her knee pop, injuring her medial collateral ligament (MCL), the band of tissue along the knee’s inner edge that connects the thigh and shin bones. Unfortunately, Alex couldn’t perform at her usual 100 percent at the tryouts, and she wasn’t chosen to play goalie. Although Alex was offered a player position, she decided to decline the offer to play on Team Canada, which would compete in Italy in July and, for the very first time, not win a medal. Alex knew that she wouldn’t be able to play her best because she needed time to heal. Soon, Alex was back playing as defenseman with a local all-female inline team that she created back in January to grow the sport of roller hockey. In June, the team traveled to California to compete in the North American Roller Hockey Championships (NARCh), where Alex scored a goal and the team took home silver. The future looks bright for Alex as she continues to get stronger with AIM at her side. In the overall anti-aging AIM product lineup, the following four supplements can help turn back the hands of time. Every time you take a breath, you inhale life-giving oxygen. But breathing also has a death-giving aspect in the form of oxidation. Oxygen loves to steal electrons from stable molecules in your body, turning them into unbalanced free radicals that damage cells, proteins, lipids and DNA. This destruction accumulates and increases over time causing age-related illnesses that include diabetes, cardiovascular disease and cancer.1 Your main defense against free radical damage is antioxidants. Proancynol 2000 contains seven antioxidant-providing ingredients: green tea leaf extract, rosemary leaf extract, grape seed extract, N-acetylcysteine, lycopene, alpha-lipoic acid and selenium, delivering an incredible diversity of protective antioxidants. For example, green tea extract is literally loaded with polyphenols2 such as catechins, the benefits of which include preventing cellular damage, protecting neurons and increasing the antioxidant activity of blood. You give your body a wide range of antioxidants from just this single ingredient. So with seven antioxidant-packed ingredients, Proancynol 2000 helps protect you from the damaging and ultimately aging effects of free radicals. Joint pain is an inner sign of aging. Frame Essentials helps to revital­ize aging joints with a combination of interacting ingredients: glucosamine sul­phate, glucosamine hydro­chloride, boswellia extract and methylsulfonylmethane (MSM). You can think of them as reparative building material for joints. The glucosamine sulphate in Frame Essentials may also help prevent one of the most visible effects of the passing of time: skin aging. A 2017 study concluded that “glucosamine sulphate has a positive effect on epidermal and dermal markers associated with age.”3 Support your inner and outer frame against the wear and tear of time with Frame Essentials. GinkgoSense supports eye and brain health with a combination of natural, anti-aging ingredients—ginkgo biloba extract, bilberry fruit, omega-3, lutein and zeaxanthin—that improve blood flow to the brain and eyes and deliver powerful antioxidants that fight free radical damage. With a natural source of antioxidants, chlorophyll, enzymes, minerals, phytonutrients and vitamins from the juice powder of young barley plants, BarleyLife nourishes the cells with nutrients that repair, build and protect the body. It’s a must for anti-aging nutrition. There’s even more to explore among AIM’s whole-food concentrates and natural supplements that promote healthy aging. The 2018 AIM Prod­uct Catalog contains them all, and you can find it and more at www.theaimcompanies.com. A busy body requires a solid frame. From active exercises to the workday grind and everything in between, our bodies take a beating on a daily basis. That’s why a daily dose of omega-3 fatty acids from AIMega® and glucosamine from AIM Frame Essentials® is essential for supporting your frame. On their own, glucosamine and omega-3 have gained notoriety for their natural benefits for joint health and heart health. Glucosamine sulfate helps strengthen cartilage and relieve inflammation. Omega-3 fatty acids lower blood pressure and improve blood flow. Combined, these two elements have shown a remarkable, synergistic effect on joint health. A group of German researchers found that combining omega-3 essential fatty acids (EFAs) with glucosamine achieves improved results compared to glucosamine on its own. The combination of EFAs and glucosamine produced significant pain reduction, which the researchers believe to be a result of the synergistic effect of the two ingredients—omega-3 fatty acids reduce inflammation, allowing glucosamine the time and space to support and rebuild cartilage. Additional research has also shown glucosamine to be as effective in relieving inflammation as nonsteroidal anti-inflammatories like aspirin, which may just mask the symptoms of arthritis. Frame Essentials contains 865 milligrams of glucosamine complex per serving in a 1:1 ratio of glucosamine sulfate and glucosamine hydrochloride. Of the two forms of glucosamine, sulfate has received the majority of research, though health care practitioners have noted the same results with hydrochloride. In addition to glucosamine, Frame Essentials also provides boswellia extract (for improved blood supply to the joints) and methylsulfonylmethane (MSM)—a naturally occurring sulfur compound that is lacking in people with arthritis. AIMega contains not only omega-3 essential fatty acids, but omega-6 as well. These essential fatty acids are derived from flax, sesame, olive, and sunflower seeds and are delivered in a healthy 2:1 ratio, ideally suited to balance the North American diet. Neither EFA can be produced by the body, so they must be a part of a healthy diet. Separately, AIMega and Frame Essentials are valuable additions to a healthy lifestyle. Together, they are an essential resource for maintaining joint health. Build up your body’s frame by doubling down on AIMega and Frame Essentials. The pain of arthritis creeps into the lives of far too many North Americans. Although often associated with people of advanced years, arthritis actually affects all age groups. One in every 250 children in the U.S. has some form of arthritis. Around fifty million adults have some form of arthritis. For the past 15 years, arthritis and other rheumatic conditions have been the most common cause of disability among U.S. adults. Over 100 conditions or diseases fall under the arthritis umbrella of musculoskeletal disorders. Osteoarthritis is by far the most common. Even though it is called a non-inflammatory condition, osteoarthritis results from the wear and tear of cartilage, causing inflamed joints. It is safe to say that inflammation is at the painful core of arthritis, and AIM defends you to the core with three products that target the pain of arthritis. Glucosamine is a building block of the cartilage that cushions bone-joint movement. However, the body’s production of this compound decreases with age. Whatever causes the wear and tear of cartilage, the glucosamine in AIM Frame Essentials provides supplemental building blocks for strong, healthy cartilage along with the antiinflammatory benefits of boswellia extract and methylsulfonylmethane (MSM). Omega-3 essential fatty acids (EFAs) are a key factor in reducing inflammation, so these healthy fats are part of the AIM defence against arthritis. AIMega provides an organic, seed oil source of omega-3, which is also an essential component for healthy cell structure, growth, and repair. The addition of AIMega to your supplemental intake is a preventative action for avoiding arthritis and an essential step for relieving its painful symptoms. The nutritious barley grass juice powder in AIM BarleyLife helps to reduce inflammation wherever it is problematic in the body. Its alkalizing effect supports a healthy body pH, which prevents the onset of diseases such as arthritis. BarleyLife’s vitamins, minerals, antioxidants, enzymes, and phytonutrients provide unparalleled nutrition for rebuilding healthy cells and promoting overall wellness. 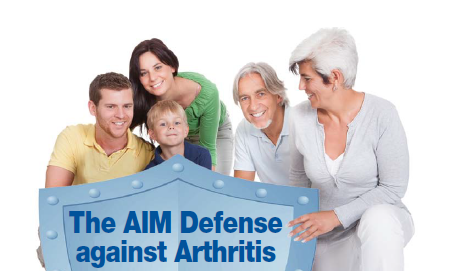 AIM defends you against arthritis with Nutrition that Works! to not only reduce inflammation, but help to repair and rebuild at the cellular level. The greatest danger to your knees is simply using your knees–as one does–for years and years and years. According to WebMD, there’s a 33% chance that if you’re at the doctor, you’re there because your knee hurts. The majority of knee problems are caused by osteoarthritis, a condition brought about by wear and tear. Athletes, the overweight, women, rheumatoid arthritis sufferers and the elderly are those people at the greatest risk of suffering this kind of knee pain. One of the simplest ways of reducing knee pain is by losing weight. A study in Arthritis and Rheumatism found that for every pound lost, it reduced four pounds of stress on the knees. In other good news, exercise that helps strengthen muscles around the knees can also reduce pain. 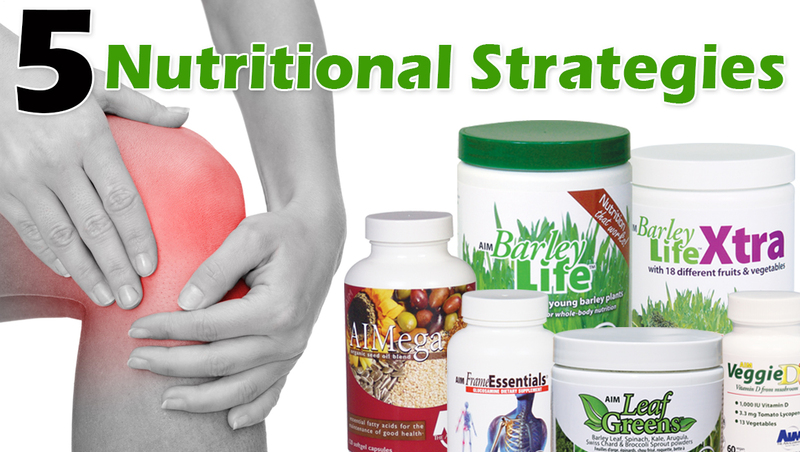 Additionally, there are several nutritional strategies that can help alleviate knee pain. Here are some. Glu, MSM and their combination produced an analgesic and anti-inflammatory effect in osteoarthritis. Combination therapy showed better efficacy in reducing pain and swelling and in improving the functional ability of joints than the individual agents. All the treatments were well tolerated. The onset of analgesic and anti-inflammatory activity was found to be more rapid with the combination than with Glu. It can be concluded that the combination of MSM with Glu provides better and more rapid improvement in patients with osteoarthritis. In 2009 study from the Journal of Orthopaedic Science, researchers found a link between low levels of vitamin K and the development of knee osteoarthritis. Increased inflammation can lead to increased pain. So you’ll want to stay away from inflammatory foods: trans fats, sugar, red meat, refined carbohydrates and the like. Instead, choose anti-inflammatory foods like leafy green vegetables, fruits, nuts and fish. Not only have Omega-3 fatty acids been shown to reduce inflammation, but low levels of omega-3’s have been linked to the development of osteoarthritis in animal studies. A study on 400 people with osteoarthritis found that subjects who had low levels of vitamin D had more than a 50% chance of their condition worsening when compared to those who had healthy vitamin-D levels.